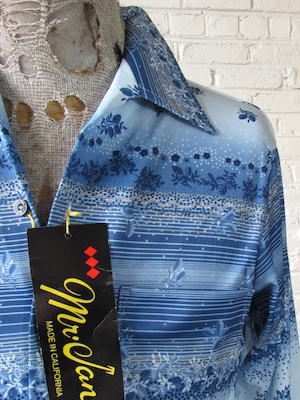 Home > Men's Vintage Shirts > All Men's Vintage Shirts > (S) Vintage Mens 70s Disco Shirt! Shades of Blue, White & Tan. Flowers Stripes & Dot Magic! Mens vintage 1970s disco shirt. Shirt has a light blue base with bands of darker blue around the chest, collar and bottom of the shirt. The lighter blue sections are covered with dark blue flowers and white polka dots. The dark blue portion of the shirt is striped with light blue lines and tan polka dots. Has a super wide & pointy disco era collar. Closes in the front with two toned black and gray buttons buttons with two matching buttons on each cuff. One pocket on the chest. Shirt has a straight hem. Tagged by Mr. Jan. 100% Polyester. Sleeves: 30" collar to cuff / 25.5" shoulder seam to cuff.